As Billy Corgan took the stage alone for an emotionally charged rendition of “Disarm,” the realization was made. The Smashing Pumpkins were in Kansas City. Nearly 20 years in the making, the “Shiny and Oh So Bright Tour” featured original lineup of frontman Corgan, guitarist James Iha and drummer Jimmy Chamberlin. They’re joined by guitarist Jeff Schroeder, keyboardist Katie Cole, and bassist Jack Bates. The show included several covers the group has become known for, including David Bowie’s “Space Oddity,” Fleetwood Mac’s “Landslide,” and Led Zepplin’s “Stairway to Heaven.” The crowd roared and pulled their weight on the vocals – Corgan made a habit of pointing to the crowd to turn over singing duty during the show. Huge video screens were moved across stage behind the group that consistently evolved from static set pieces to video screens, displaying different videos from across the years to specific imagery for each track. Notably missing, from the tour and the screens, was original bassist D’arcy Wretzky who had traded headlines with Corgan in the buildup to the tour about her absence from the group and future projects. Touted as a reunion tour, Corgan, Iha, and Chamberlin made up stage center, with the three gathering around Chamberlin’s kit throughout the set and giving fans that sense everything is right with the world – the trio has recently recorded the first original lineup Smashing Pumpkins music with legendary producer Rick Rubin. Hearing the original lineup made for a meaningful night for everyone at Sprint Center, especially those who cherish those five albums cherry picked for the tour. The show tapped into the nostalgia engulfing pop culture, although it never felt forced or inauthentic. 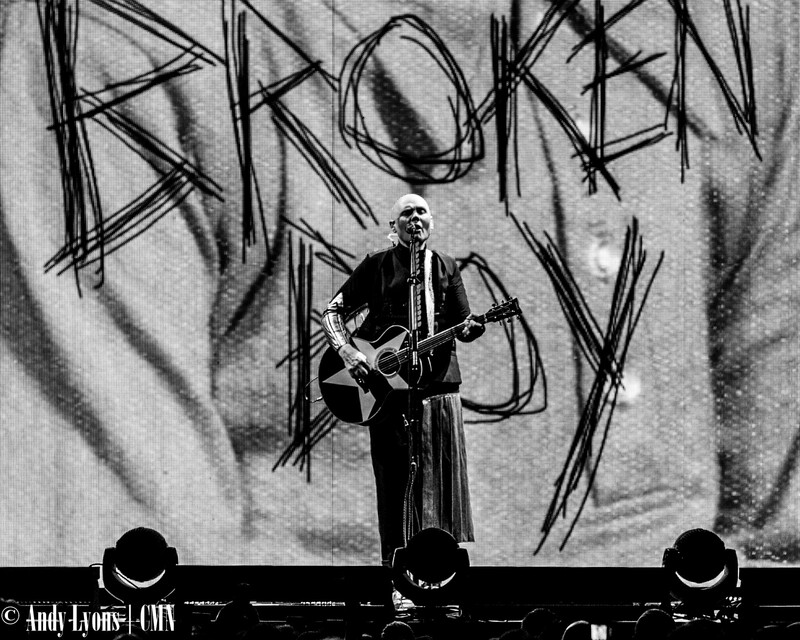 The return of Smashing Pumpkins gives fans a taste of the past, as well as something to look forward to with the forthcoming album. Be sure to follow Central Mo News on Facebook for the latest in area arts and entertainment.